I am currently trying to determine the placement of my shock mount location. I had initially planned to place the mount on the bearing cup. But i am working on figuring out how to determine if this geometry will work or not. Is there a particular way one should decide where the shock mount should be located? all based on your design requirements. Ideally as close to the bearing as possible as this will reduce the bending moment that your arm sees. be mindful of the space needed by the rim though and the diameter of the shock. some more space can be had by running different rim offsets, however be wary of the effect this has on the forces everything sees. To play devil's advocate, placing it closer to a 2:1 leverage ratio will give you a higher frequency which can help in jumping , whoops, and pretty much any obstacle. There is no perfect place, it is a bunch of trade offs. You need to decide what the goal of your suspension is and what it is trying to maximize and minimize. Good cornering? Extreme lightweight? I initially wanted to position it exactly in this manner due to the reasons you stated, however it would seem that our shocks may not be long enough to position it this way and still maintain a good angle for the shock. The frequency of the suspension is not just tied to the shock position though. it also depends on your unsprung weight, and the stiffness of the shock. I am having trouble determining the mounting location of my coil over shocks on the trailing arm. Can anyone assist? 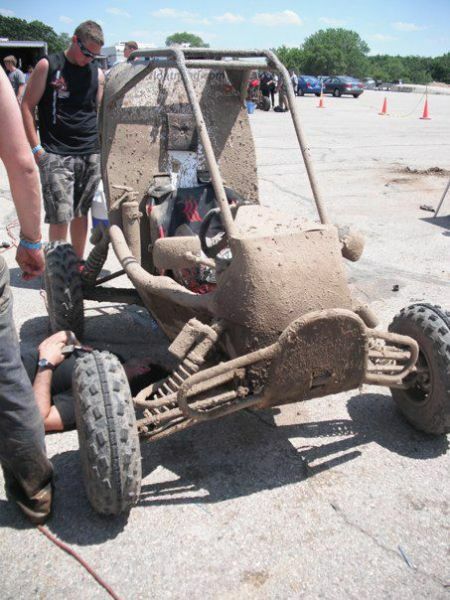 did you not figure that out while designing the trailing arm?